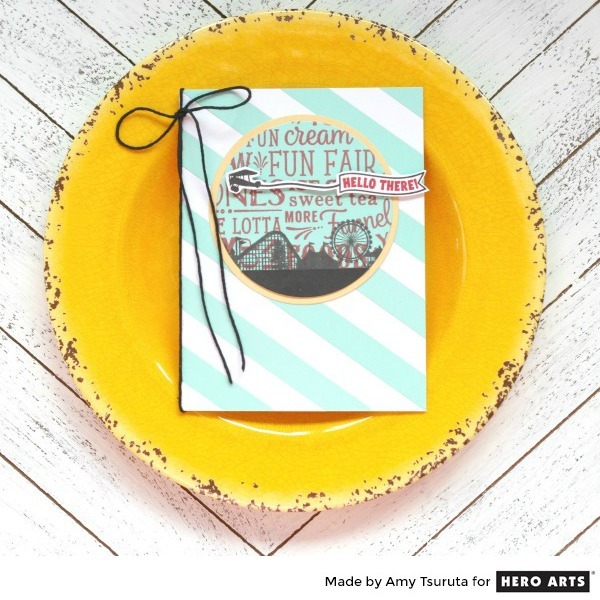 Tsuruta Designs: Hero Arts July My Monthly Hero Blog Hop + Giveaway! Hero Arts July My Monthly Hero Blog Hop + Giveaway! I'm so excited to be participating in today's Hero Arts July My Monthly Hero Blog Hop! Today is day that the kit and Optional Add-ons hit the Hero Arts Store. You should have arrived here from the Hero Arts blog, where the fun begins! Get Them All - July Add-ons AVAILABLE HERE. 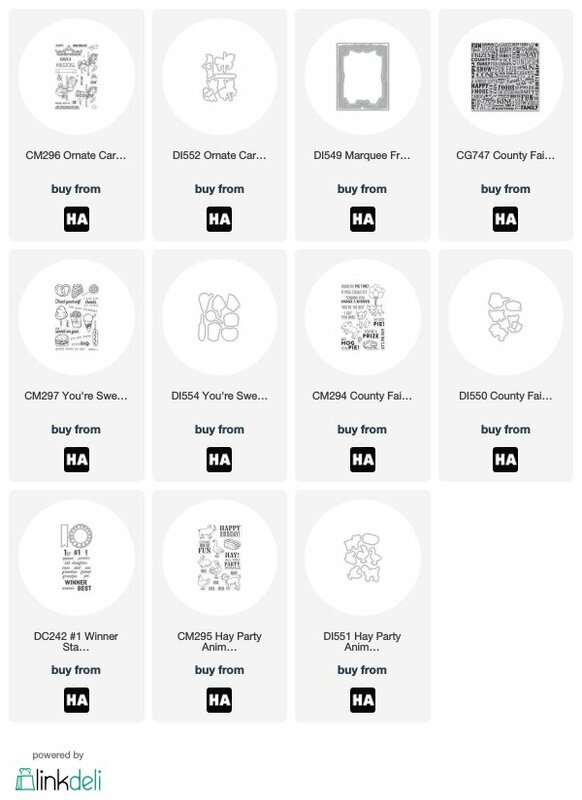 REMEMBER, when the MAIN KIT is gone, it is GONE - SOLD OUT! Kits begin shipping from Hero Arts on Friday, July 6th. Remember that you can now SUBSCRIBE to receive the kit monthly and never miss one! Hero Arts is giving away one kit as a prize to one blog reader - selected from the comments across all of the blogs in the hop. 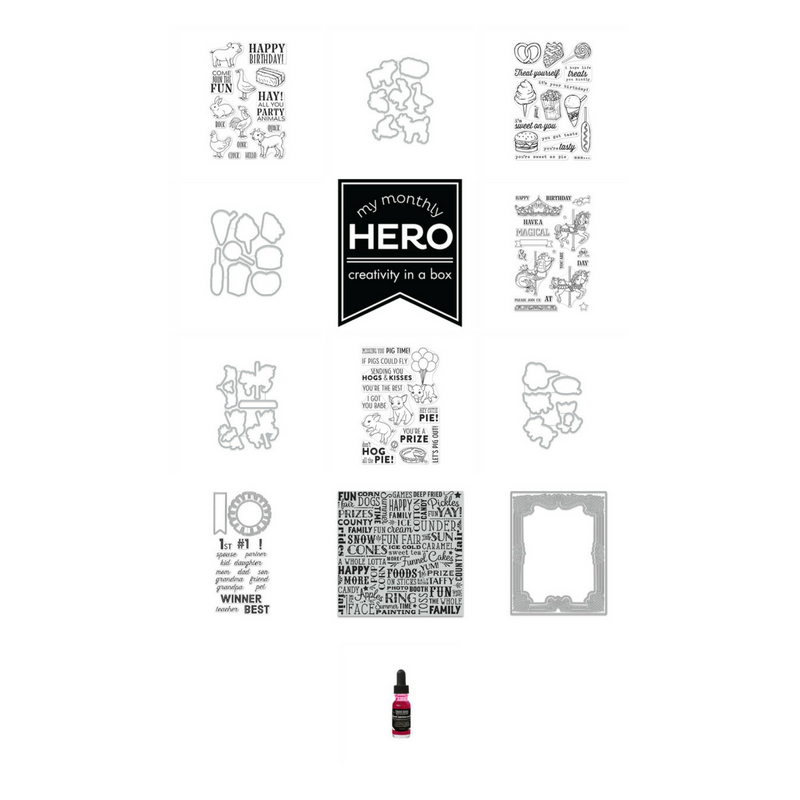 (Hero Arts will reimburse if the winner has already bought the kit) Giveaway closes Sunday, July 8th at 11:59pm, and the winner will be announced on the Hero Arts Blog the following week! I went with a retro look with the soft aqua and soft pink colors. I absolutely love the sentiment's play on words. I'm definitely a Clean + Simple card designer at heart, all that white space makes me a happy crafter. Those guys crack me up! I am loving the CG747 County Fair Bold Prints! I used a layer of vellum in between the animals and the County Fair panel so that there was a softer panel underneath the animals. I can't wait to hop around and see how everyone was inspired. Next up is the awesome Clare Prezzia! I love what you created! That first card is stunning with the crisp white and subtle pastel coloring. I love the cards especially the first one with the soft colors. Awe, these are so cute. I love the color scheme. Sweet cards! I love the farm animal card - adorable. And I love the very soft palette of the first card, too. What a wonderful kit and some great cards! I like the clean and simple look of your first card. Oh my gosh, the animals on top of each other is adorable!!!! I love the aqua & pink you chose. Very retro & very beautiful! The animals are too cute. I'm enamored with the lil piglets.❤ Great cards!! LOVE your cards and chosen colors. The "party" animals are adorable. TFS! I love the party animals. The grand-kids show their critters at the county fair. This is perfect for them. All 3 cards are so pretty. The pastel colors remind me of cotton candy & are nice with this theme. These are so sweet, Amy! I love how you stacked the animal on top of each other and used vellum behind the animals. Cute! What pretty cards. Love your colors - the soft aqua is a suprising choice, but really beautiful. Cute cards. I like the colors and the adorable animals. Love your cards! Simple but absolutely sweet! Definitely did a great job showcasing the kit! Love your simple cards and the color theme. I am always compelled to color it all. It’s great top see how well just two colors work. The 1st card colors are so sweet for a baby card. What fantastic cards! Love the soft pastels that you used. Great work! Beautiful! Love the clean and simple look. Pretty cards, I love the soft colors in the first card, and the aqua and bright pink in the last two cards. Love the retro colors you used on the first card. Great cards! And the new kit looks like another winner from Hero Arts! This is a fun set. Love the cards and your creativity. AWWWW! I ABSOLUTELY LOVE these cards! I LOVE the soft pastel colors that you have used for each of the cards! ABSOLUTELY GORGEOUS! 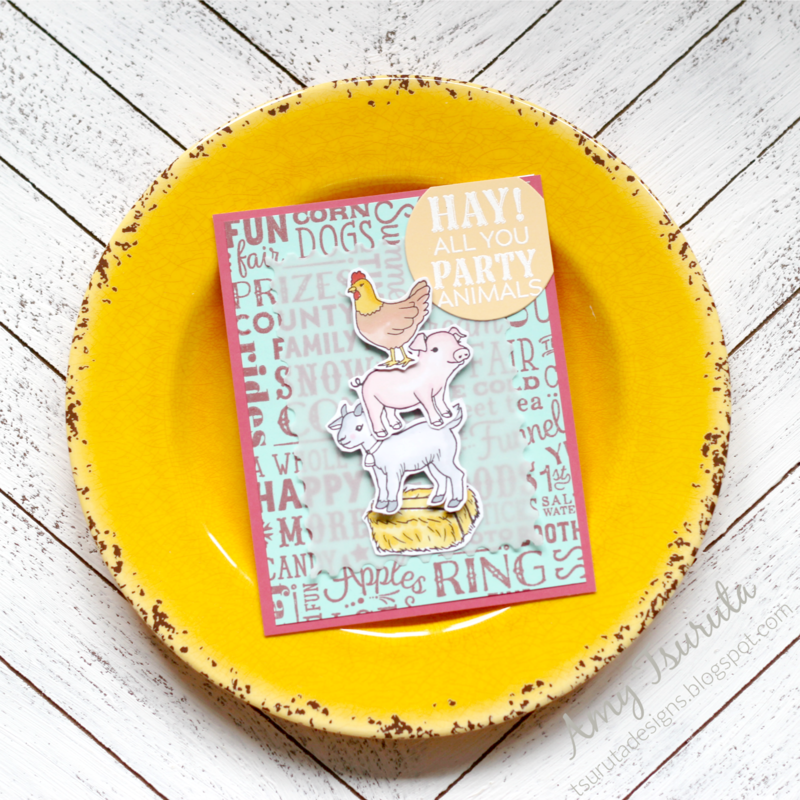 And the Hay Party Animals card is just so PRECIOUS! Wow. I especially love the stacked animals! Love your color choices. 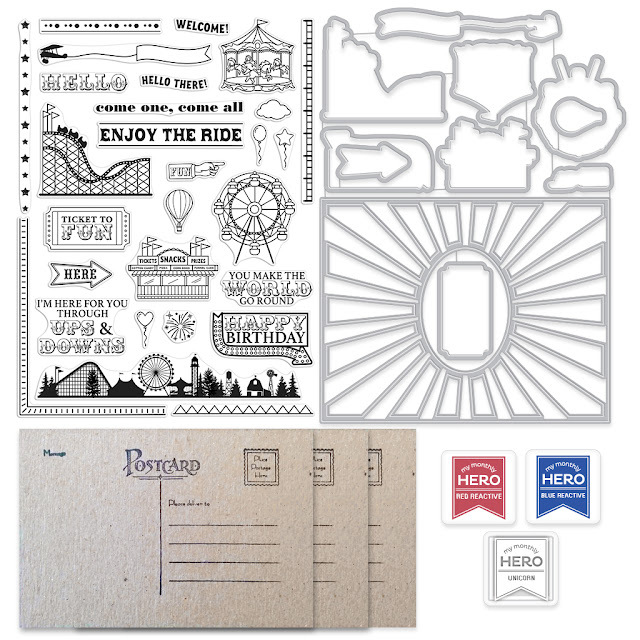 This stamp set screams retro!!!! All your cards are so cute, but the first one is my favorite. Such a great kit!! Your cards captured the sweetness of this kit. I adore pastels and you made it work so well in your card! I love all these cards but the first one with the pastel and lots of white is my fav. Oh wow your cards are so awesome! I especially like the party animals one with all the animals stacked up. Super cute! I like the sentiment and roller coaster in the first card. Love the cards and colors used on them. Love the soft colors. Also love how clean your cards are. Can't wait to get my kit. Love the stacked up animals and the way you've used the background stamp. Love the colors you used on the first card! Love the other pretty cards too, what a great kit! I was taken by the way you used the soft colors for the Fair card.....soft and sweet....thank you so much. Super fun and sweet cards! I love you soft color palette and clean designs. The party animal card is my favorite!!!! I love the color scheme and the clean look of the first card. inspiring! Love love love loveeeeeeeeeeee these! LOVING the rides and the animals are ADORABLE!!!!!!!!!!!!!!!!! Your cards are beautiful and very inspiring ! What fun your carnival creations are. Especially like the cute critter ones. CUTE cards, I love this fun summer kit! I love the adorable animals card! Love that card with the pig add-on from this release. I'm really trying to restrain myself, but I may need to splurge on this one. WOW Amy... those cards are fun, fabulous, and cute. I LOVE each of them. Amy, I LOVE YOUR WORK! And your photography with this set is great! with the yellow plate behind. I love the rollercoaster card the most! Love the retro look. The animals are are cute too. Wonderful cards. I loved the first one. Simple and elegant! All of your cards are simply amazing, Amy! Love the first one best! Love your cards! I love that this is such a different collection - it just says summer fun! Thanks for the inspiration! Fabulous cards! I love the tower of animals! Great way to use the Hay Party Animals. So cute! The colors you used are so sweet and kind. Love all of you cards. Love the colors you used on these projects. Very cute! The background of your card is just beautiful! I'm loving this lit! This kit is so much fun! My favorite of your cards is the first one. I love the softness of it, which is very different from the blaring lights you typically see at a carnival. These cards are fabulous! I love the first one with the mint! I love the colors in your cards, there is awesome!!! Wow! Gorgeous set of cards!!! I'm totally in love for your first one! Combo of colors and the design are simply amazing!!! All the cards are looking awesome! This month's kit is all about summer!! Love the pun sentiments! Trying this one more time! Because you ROCK!!!!!! I love all your work! Amy - I enjoyed all your cards shown here! I love how the sentiment set against the carnival ride backdrop is sure to bring a smile to your face, even if you are going through a hard time! This is a great kit! Your cards are adorable Amy! I love the color combinations you chose. The white and aqua are gorgeous! You are the bestest! Thanks for being part of this blog hop! I adore the color combos you chose! All of the cards are lovely. What a great use of the this kit! Simply gorgeous samples with July's kit and ad ons!! Love the retro colors on the main set, and adorable card with the Hay Party animals.And the last card is adorable with the silhouette of the rides with the airplane! Great cards all!!! Love the soft colors! Fantastic cards! The CAS look on the first is wonderful and I love that background stamp on the other ones. Great card--I'm so in love with those cute farm animals! What a great kit from HA! of them are so pretty. Love, love, love the non-traditional colors you used! love the pastel card! Thanks for sharing. All of your cards are so pretty, but the very first one with the pretty touch of blue is my favorite! It's so subtle and fresh! Very pretty! Love your choice of colors, fun cards! Sooo, cute and love the add ons! Such adorable cards! Thanks for sharing.. I love your soft colors! Love your fun cards. Those animals standing on top of each other are so cute! Great kit and love your creations! The animals on top of each other is adorable! Thanks for sharing. Another amazing release. Great patterns and designs. I just love it, so fun. Both cards are very nice! The retro colors and really interesting on your first card. Those stacked animals really catch my eye and that is a darn cute card. July's kit is so fun. Love the retro! I prefer a CAS card making style too! Love the color palette you chose! Definitely gives a retro vibe! Coffee Loving Cardmakers | You Got This! Fancy Pants Designs | On Our Way!